Many people wonder how to rejet their carb when they've changed some of the emissions systems such as setting their truck up for off-road competion by removing the EGR. Fortunately Canada didn't use the EGR system as early as the US did on some engines, so we have the jetting that Ford used for the early 80's Canadian trucks to use as an example. However, figuring out what Ford used is somewhat complex in the parts catalog, so I'm going to give you a simple answer up front, followed by a more detailed answer below. Moderate Answer: It isn't quite as simple as that. I haven't found anything different on the YFA. But, from what I can tell two different 2150's were used on trucks w/o EGR: those with and without the variable high-speed bleed system, aka "metering rods", as shown in the picture on the right - which was borrowed from Bubba's site where a lot more info is given on the bleed system. 302: D7TZ 12127-AA (DA-1609), and it will have a tag on that reads D7TE 12127-ADA. Deep Answer: But, someone may want to know how I determined the above info. 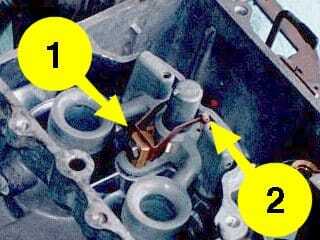 I used Ford's Master Parts Catalog as explained on my page called How To Find Carb Parts. But, when you are looking through the Application Cross Reference you need to find the Canadian uses of the engine in which you are interested.